Before writing any tests you need to set up your development environment by installing a few tools and configuring one or two files. This blog post is based on Windows platform using Node.js and npm (Node Package Manager). 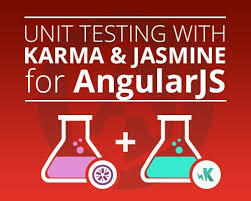 Karma is the testing framework from the AngularJS team at Google, it was formerly known as Testacular (good thing they changed that name). Enough of the introductions, time for the fun stuff. First a caveat, due to the endless variations of developer environments, the steps outlined here might need a few adjustments. Things like system variables and paths to certain files may cause errors on your computer. The Jasmine framework allows you to create test suites using specs. When applying this to an Angular project the advantages of Dependency Injection become crystal clear. A typical karma.conf.js looks like the code below, and is generated automatically when you run the karma init command from terminal or command prompt (cmd.exe in Windows). Lines 13 – 26 above include paths to all relevant files for your unit tests. Starting with required libraries for your application, then your application files and then the unit test spec files. A quick test can be implemented by saving the code below in a file named example.spec.js in the js/tests folder (see line 26 above). Execute the command karma start from the command prompt. For testing AngularJS, you need a little more Jasmine code. As an illustration, take the bare bones mainCtrl controller in the ng-app myApp. It has one scope variable myData which is array. We can test for the length of the array or simply test that the variable has been defined. In the unit test below, first you create a describe block for the myApp app. And then load the module using beforeEach. Then you have another describe block for the controller and this includes another beforeEach method with built in directives $controller and $rootScope injected using inject.